How It Works: ZP-700 Engine Oil Treatment provides crankcase lubrication beyond ordinary motor oil and fulfills the need to increase the auto and truck life cycle. ZP-700 Engine Oil Treatment is made up of two major components: the first functions as a subsurface intense pressure lubricant and impregnates bearings as an undersurface lubricant, exuding out of metal by operational heat. The second is Molybdenum Disulfide (MoS2), a mineral additive with a lubricity 4 times that of oil. The combination results in a tremendous lubrication value that has never been duplicated. 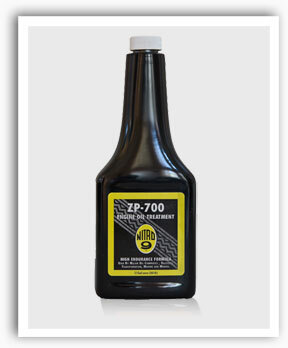 ZP-700 Engine Oil Treatment provides both metal-to metal protection and reduction of friction heat load. What To Expect: ZP-700 Engine Oil Treatment established documentation shows that engines using ZP-700 Engine Oil Treatment stay in service two to three times longer with continued use. Reduction of expensive repairs and repetitive trips to a service center are also money saving benefits of using ZP-700 Engine Oil Treatment. The oil additive will help the engine smooth out. This can be observed by a reduction of engine vibration. The extra lubrication will make starting easier because once ZP-700 Engine Oil Treatment is used, it leaves the bearings pre-lubed. With continued use, you no longer have to worry about excess wear due to cold, dry starts. Directions: Basic Ratio - 1:20. For auto/pickup - use one part ZP-700 to 20 parts oil or apply 12 ounces (360ml) bottle every 6,000 miles to the crankcase or every oil change. For heavy diesel, apply 1:20 every 12,000 miles. Technical: Liquid - Dark Gray Color - 290° Flash Point - Reactivity Stable - Harmful if Ingested.